This was a fun two afternoon painting. Below are the steps in the work in progress and photo of the setup. This was painted about a year after my mother passed away. It’s poignant to be painting some of her special glassware. Rose in Mom’s Milkglass Vase, Procreate sketch on iPad. Continuing on with my big May catch-up on posting work from the past few months. It was a gloomy winter day but one of the volunteer calla lilies was blooming and I had to paint it. This was a one-session alla prima oil painting. I’ve been working on doing Alla Prima (all at once) paintings in order to become more decisive about the paint I put down instead of noodling around. It requires getting the drawing right, understanding what I’m seeing and if it fails, starting again instead of trying to keep fixing, which usually goes badly. 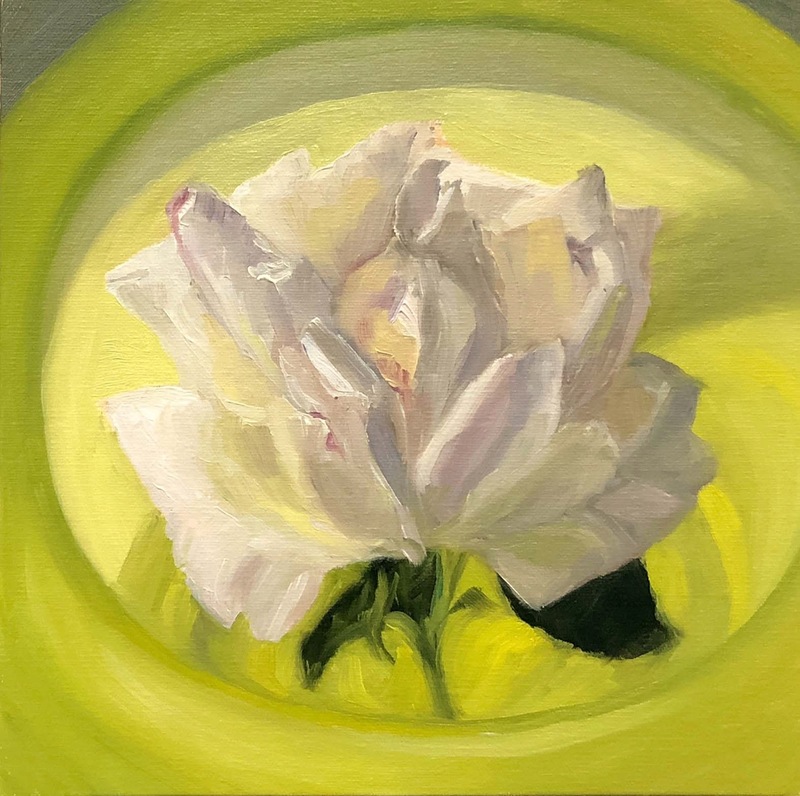 This was the third attempt at painting a rose in my mom’s yellow glass bowl. The previous attempts and photos of the set up (as the rose opened) are below. Attempt #1–should have left rose as is. This was a quick little painting from life that happened spontaneously one afternoon when my tenant came out to my studio and presented me with some freesias in a vitamin bottle. It might have been a more interesting painting if I’d a) included the lettering on the bottle and b) taken time to do a preliminary thumbnail sketch so that the flowers weren’t almost touching the top of the panel. I was interested in looking at white in shadow and gray in light and shadow and the colors found in both from the warmish light and flower reflections.